WASHINGTON (CNN) -- President Bush told the Republican National Convention on Tuesday that presumptive nominee Sen. John McCain "ready to lead," saying he's been prepared for the presidency by a lifetime of service. President Bush says John McCain is "ready to lead" the United States. 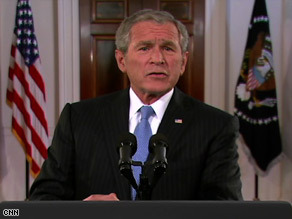 "We live in a dangerous world," Bush said, speaking live via video. "And we need a president who understands the lessons of September 11, 2001: that to protect America, we must stay on the offense, stop attacks before they happen and not wait to be hit again. "The man we need is John McCain." He made the comments live via remote from the White House shortly before 10 p.m.
Before Gustav roared into the gulf, Republicans had wrestled with how to incorporate Bush into a convention in which McCain is expected to try to distance himself from the president, whose approval ratings are hovering around 30 percent. After deflecting several reporter's questions, White House spokeswoman Dana Perino said it was a "mutual decision" that Bush would address the convention remotely instead of appearing in person. She called speculation that the convention was trying to lower his profile "psycho-babble," and said Bush wanted to remain available should the aftermath of Gustav prove more troubling than expected. "It takes a lot of logistical effort to move a president anywhere," she said. "And thankfully, there's technology that exists today that President Bush can give a satellite address that will be live for the people in the hall." In his speech Bush sought to reinforce the McCain campaign's theme that the Arizona senator is a maverick who has been willing to buck his own party's leadership. "John is an independent man who thinks for himself," Bush said. "He's not afraid to tell you when he disagrees. ... No matter what the issue, this man is honest and speaks straight from the heart." In the remarks, Bush touted McCain's support of the troop "surge" in Iraq, which backers now credit for improvements in security there. Democratic presidential nominee Sen. Barack Obama's campaign wasted no time using Bush's comments to once again tie McCain to the unpopular president -- as it has attempted to do throughout this election season. They commented on excerpts released before the speech. "Tonight, George Bush enthusiastically passed the torch to the man who's earned it by voting with him 90 percent of the time, and who will continue this president's legacy for the next four years -- his disastrous economic policies, his foreign policy that hasn't made us safer, and his misguided war in Iraq that's costing us $10 billion a month," said Obama campaign manager David Plouffe. "The man George Bush needs may be John McCain, but the change America needs is Barack Obama." Bush also said he's thankful that damage from Hurricane Gustav was less than many had feared and credited the governors of Louisiana, Mississippi, Alabama and Texas for their work coordinating with federal officials while preparing for the storm. "All of us are keeping the people in the Gulf Coast in our thoughts and prayers," he said.